Robert and his tutor Jerry work on algebra homework together. Schools of Hope is a unique collaboration of the Madison Metropolitan School District, Centro Hispano, Urban League of Greater Madison and United Way of Dane County. 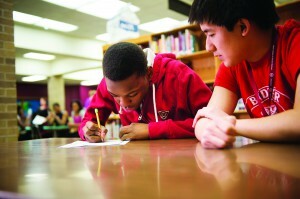 Schools of Hope is uses an effective, one-on-one or one-on-two tutoring model that provides trained tutors. Tutors are in place in Madison, Sun Prairie, Oregon, and Middleton/Cross Plains school districts. This initiative is changing Dane County. 95% of teachers report volunteers contributed to an increase in student skills. In addition, Sun Prairie’s racial achievement gap has nearly been eliminated in reading and math at the elementary and middle-school levels.